FROM THE RECTOR On Friday 3rd March the local Women’s World Day of Prayer service took place in St. Mary’s Priory. The theme this year was from the women of the Philippines ‘Am I being unfair to you (women)’? Following on from our last Alpha course we had decided to meet up every seven weeks and on 9th March we had our second reunion. It was good to catch up with the participants and to hear how the course continues to impact on their lives. We had a couple of visits for school tours from the children of Glenasmole National School, Bohernabreena earlier in the month. As their school is a small, almost country school, we had smaller groups of children then usual who were used to an old church like ours, as their church in Bohernabreena is of a similar vintage to St. Maelruain’s (compared to the other parishes in Tallaght, which all have ‘modern’ churches). Since the Glenasmole tours we have also had visits from the other St. Maelruain’s National School in Old Bawn. On the evening of 24th March we had a Concert in the Church with the choral group ‘Capella’. It was well attended considering there was an Ireland soccer international on the same night. One of the members of the group had attended the ‘homeless’ event which we had in the church late last year and realised what a perfect venue the church would be for a concert. Mothering Sunday / March Family Service was on Sunday 26th. Thank you to Regina Donoghue and Vivienne Bright for making the posies to give to the ladies in the congregation, they were lovely and very much appreciated. I chose the reading Luke 2: 41 – 52 (when Jesus got lost in the Temple) and it probably tugged on the heartstrings of all the Mums (& Dads) in Church! We had coffee after Church in the Hall in aid of the Good News Club Lenten Project, ‘Church in Chains’ which is an independent Irish Charity that encourages prayer and action in support of persecuted Christians world wide, with a special focus on China, Egypt, Eritrea, India, Iran, Iraq, Nigeria, North Korea, Pakistan, Syria, Turkey and Uzbekistan. We have been following BACI Migrant Lenten Bible Study during Lent and will have services each morning of Holy Week with an evening service on Good Friday as well. May I take this opportunity to wish parishioners a very happy Easter! A time for renewal and a fresh start both in our lives and as the seasons of the year continue. The resurrection reminds us it is never too late to start again. Good Friday 10am Good Friday Ante Communion. 8.00pm Good Friday Ante Holy Communion. EASTER VESTRY The Easter Vestry (Parish AGM) will take place this year on Sunday 7th May after a shortened Holy Communion Service. This is an opportunity for you to have your say in the running of the parish. FLOWER GUILD We will decorate the Church for Easter on Saturday morning April 15th from 9 am to 12.30pm. Looking forward to seeing all the members of the flower guild along with anybody else that would like to join us. There's a job for everyone! Donations of fresh flowers and greenery will be much appreciated, or indeed if you would like to make an arrangement at home and bring it along, that would be great too. Everybody welcome. Your help will be rewarded by the finest of tea, coffee and biscuits, kindly provided by Valerie. The chat is always good too! MOTHER’S UNION / FAMILIES FIRST We had a very interesting talk about life as a college chaplain in I T Tallaght from Sr. Bernadette, full time college chaplain, William being the one second one! She also gave us some interesting insight into her own background and her story of becoming a nun. We thank Sr. Bernadette for coming along and sharing her experiences with us. A very interesting discussion took place afterwards about reaching young people who while claiming to be spiritual would appear to be walking away from organised religion and its sacraments. Saoirse are looking for bin bags, face cloths or hair brushes this month. Our next meeting is our AGM with Bring and Buy when we will be electing a new committee. BOWLS CLUB Congratulations to the Price Team for winning the cup and being promoted to the McIllwaine for the next season. Best wishes to Imelda Bird, we are thinking of her as she recovers after her accident. 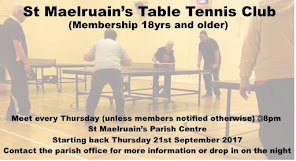 TABLE TENNIS There will be no table tennis on Thurs, April 13th during Holy Week. Wishing all a Happy Easter! GIRLS BRIGADE The Girls Brigade enjoyed another successful day of District competitions, with their Explorers and Seniors competing. Solo skipping medals were won by Abby Phelan, Alice Potterton, Danielle Egan and Sophie McGlynn. Our Explorers also came 1st and 3rd in both team dances. 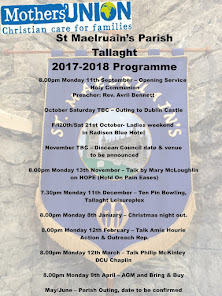 Our session is now drawing to a close and as this goes to print we are looking forward to our Annual Company Display on Saturday April 1st at 3pm in St Maelruain’s Parish Hall. It promises to be a terrific show and we always love to see our regular guests, and we especially enjoy seeing our past members and meeting new friends who are thinking of joining GB. We will report on the Display in next month’s Newsletter. WHIST DRIVE The next Whist Drive take places on Monday 24th April (note change of usual Monday due to Easter), in the Small Hall, all welcome! 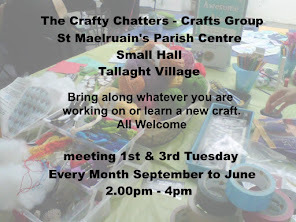 CRAFTY CHATTERS We will be meeting on the 4th and 18th April from 2 - 4pm in the Parish Hall. Please get you knitting needles, crochet hook, needle and thread or anything else you are working on. The chat is always good and the cup of tea always hot, you would be most welcome! PARISH COFFEE Our next Coffee Morning takes place on Friday, 28th April, 10.30am - 12.30pm in the old hall. 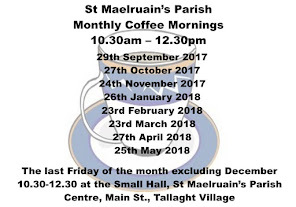 This is our monthly opportunity for parishioners, friends and visitors to meet up over a relaxing cup of tea or coffee. Do drop in and join us, all welcome! NOW AND THEN will be performing their production of the ‘Messiah’ in St. Mary’s Priory running from Tues 4th April – Friday 7th April at 8pm. Phone 085 820 6973 for more information. PARISH SCHOOL Our school had a busy start to 2017 with children taking part in the Credit Union Table Quiz on 27th Jan. Our senior team finished third with the juniors finishing in joint first place after ten rounds but sadly lost in the tie breaker, well done to all! In Feb. we had ‘Friendship Week’ focusing on respect and tolerance and also in Feb. we had Book Week with a visit from former St. Maelruain’s teacher Gilliam Perdue who is now an author of children’s books. In March we had Engineers week with the children working with Lego and Paper and the Infants classes working with plasticine, designing boats for a floating and sinking workshop. The children continue to enjoy rugby, swimming, cross-country running and taking part in our school choir as extra curriculum activities. If you have a child you would like to enroll in the school please phone the office between 8.30am and 11.30am on 452 7933 for more information. GOOD FRIDAY Walk of Compassion Beginning at the Priory grounds at 6.30pm which proceeds to St. Maelruain’s Church gates passing places that are significant to the community. The event is open to everyone. All Welcome. CROSSROADS Church of Ireland Social Group will meet on Sunday 2nd April, at the Newbridge Museum of Style Icons at 2:00pm.Contact: Georgina 087 6716 745 for more information. Crossroads meet on the last Friday of each month in Buswells Hotel, Molesworth Street at 9.00pm. The Harding Boys Quiz will take place on Thursday May 18th, 8.30pm sharp in the Dublin Conservative Club, 20 Camden Row, Dublin 8 (Opposite the Old Meath Hospital) €5 per person or €20 per table of 4. No late arrivals please! SUMMER SALE The date for this year’s summer sale has been set, Saturday 27th May. Thankfully there is a stretch in the evenings and we have been enjoying nice weather, time to clear out those cupboards, attics and garages? 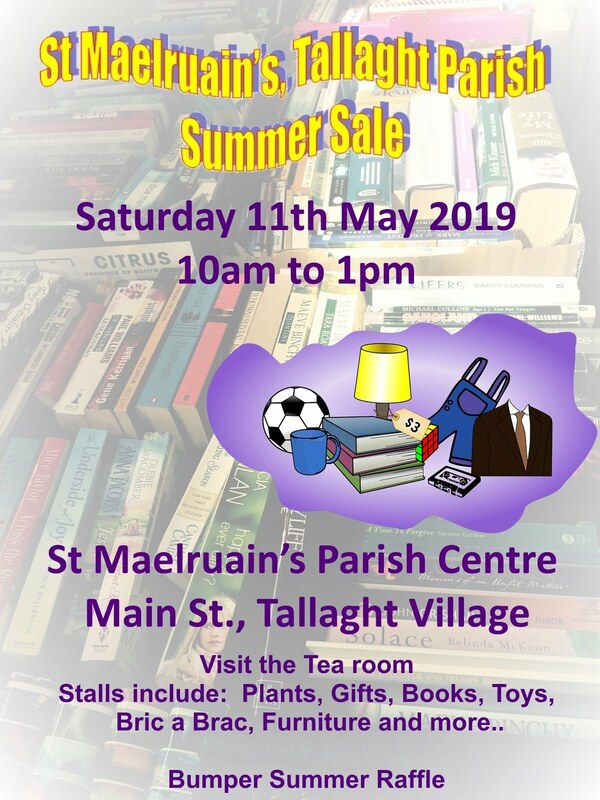 Donations of unwanted gifts, furniture and household items (in good condition!) gratefully received. Please put the date in your diary and bring along your family and friends on the day. PRAYERS FOR THE PARISH continues on Monday evenings at 8.00pm, in the Main Hall, needs your support. MIGRAINE The Migraine Association of Ireland is delighted to announce a Migraine Self Help Course. It will take place in the Maldron Hotel, Tallaght, Dublin 24, consisting of three sessions held over three weeks which take place on the 5th, 12th and 19th of April 2017 from 7 pm – 9 pm. The Course is run by Clinical Nurse Specialist Jane Melling form the Migraine Clinic at the Mater Hospital. Call 894 1280 to register or for more information.